A brand new start… what is it about? Setting another goal, the beginning of another long- distance race from the get-go, final chapter of a love story… How would you define it? It’s most likely something the way more than just the end of a season. It starts from within – the spirit, the soul, your true colors that paint everything around including your wardrobe. Genuineness can’t be muted or disregarded. It shines from inside and shaded tones sketches are no longer the option. It draws every contour towards the total rise of the spring outbreak. The brushes that you use erase all the silhouettes of dark and grey simply because they have no chance to survive in this blossom. But you’re the only one who truly knows what makes this drive so strong. Let your colorful aura shine, spread the endless energy, spark brighter than the first spring sun while everything else is black and white. This is the time when you should wear what you feel, put as much blush as you wish, use various tints and shades, no hype but only authenticity has a right to reign. It’s not a secret that a color is a form of non-verbal communication so why not to learn this language too? Be real, make it individual – a concept of “You” since you are the one who always knows your color! Isn’t it an amazing way to make a statement of how you feel or to indicate your own mood? It’s like you share the state of mind but still leave them all in guesses.As long as the color can influence our behavior, our acts and emotions, it’s nothing else but a true power in the hands due to the fact it can do absolutely the same to other people as well. So pick a hue scheme and see what’s happening! It’s impossible to miss the chance to finally gratify and appease the lust for life: empty stores open up again, new fashion life is on the horizon, and even you assume colorful clothes never quite seem to fit into daily life you got to trust us: forecasts claim it to necessarily suit your business schedule. Pick unbelievably optimistic yellow sweater from Michael Kors collection and it will represent your mind and the intellect according to the color psychology. Don’t forget to complete the look wearing skirt, and “so California” metal belt-buckle that seems incredibly polished and sheeny. Too risky you think? Not a fan of West Coast? Then New York with its DKNY taxicab yellow dress is just for you! It might surely be one of the most colorful and business developed cities in the whole world. That would undoubtedly work for you! And if even this doesn’t satisfy your quest then one of the Akris trouser suits would definitely please even such a strict fashionista who doesn’t like luxury style as for the office. It’s ultimately a fabulous alternative of outfits made in so many splashy colors. In this case sun glasses wouldn’t hurt though, the collection is literally glaring. Whether you consider yourself being glamorous but yet composed, aristocratic but nonetheless affectionate (typical qualities which the pink color typifies), Frida Giannini knows what suits you most at the end. Her extremely feminine spring/summer collection will make all the icy hearts suddenly cheered. Gucci is all about chic and stylishness. Those who seek appreciation and admiration will get engrossed into endless ruffles stream right after putting one of the gorgeous gowns on not mentioning the color itself. Appositely there is another ambassador of Italian bohemianism. Etro indicates the same huge passion to the pink, green and turquoise this season, although there are a lot of eastern silhouettes with flora patterns in both collections. The choice couldn’t be more obvious. 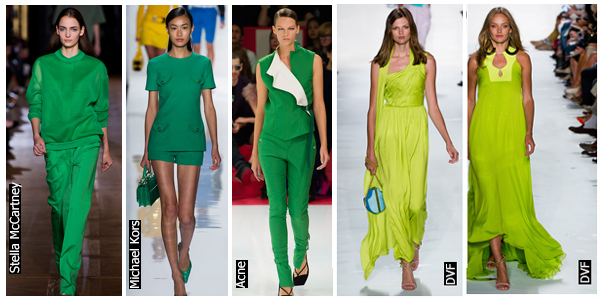 Green is the color of growth, spring and renewal, turquoise recharges our spirits. This is exactly what we need when spring arrives. And still remember that the meaning is what we create. It does not exist in the color itself; it’s mostly the outer shell that will always represent what lies within. 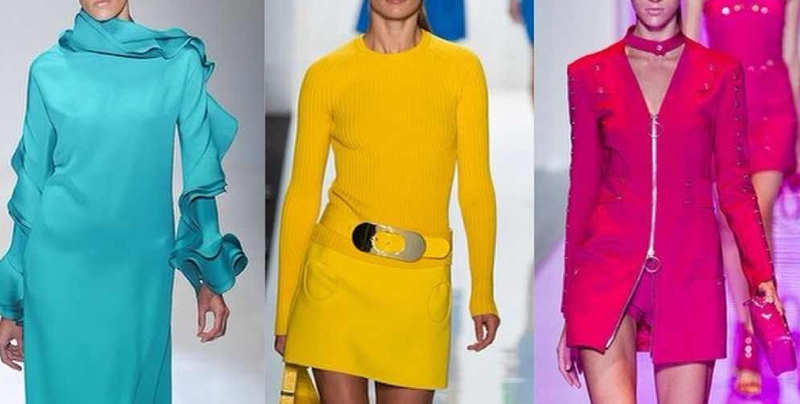 Designers provide this kind of a color therapy just to empower the dormant spirit, forcing it to soar after the longest winter ever. So dress it up and show off your true colors!